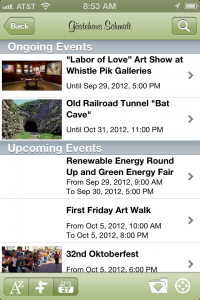 If there is an event going on when you are in Fredericksburg, it will appear at the top of the list. Touch the event you are interested in and get a description of the event, the website, Facebook and Twitter pages. You can even call the venue to ask questions. If you want to go to the location, touch “Map/Route” and get turn by turn directions to the event! If your favorite location isn’t in the app, tell them call us!